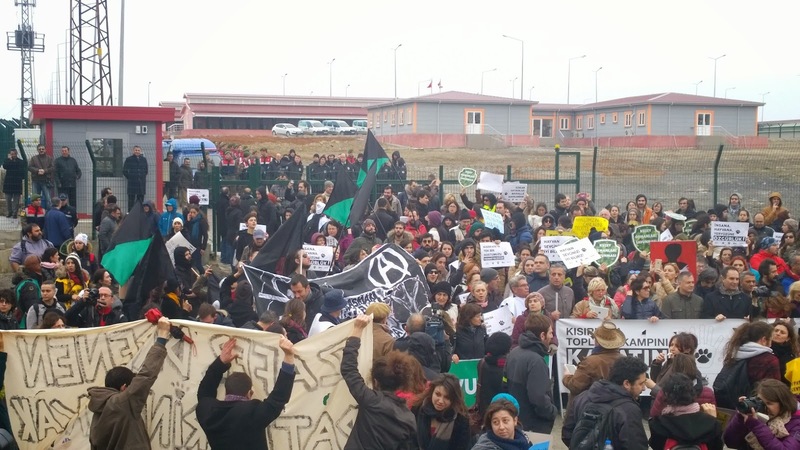 The “Kısırkaya Temporary Unclaimed Animal Nursery Center and Living Space with Garden” that the Istanbul Metropolitan Municipality has been building in Kısırkaya, Sarıyer was protested by hundreds of defenders of the right to life consisting of animal rights defenders, environmental activists and different activist groups. Groups in the provinces of İzmir and Ankara protested simultanously to support the Istanbul residents. 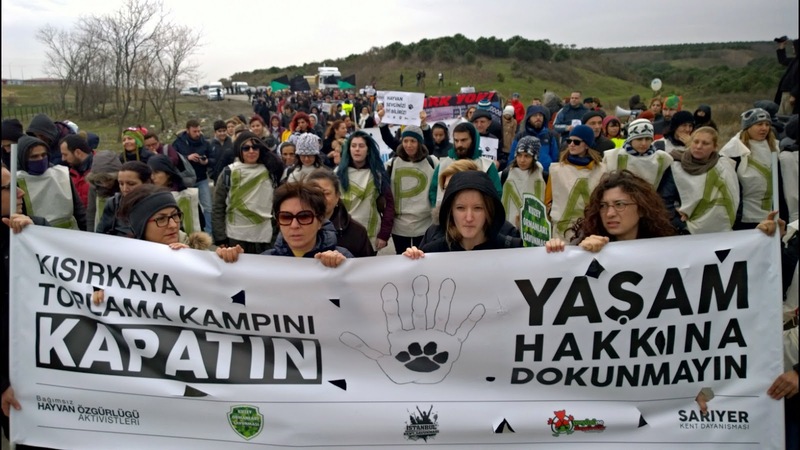 Activists that began to gather in the Kısırkaya village, which became a favorite spot for rent seekers due to its proximity to the 3rd bridge and the connection roads, with the call of the Independent Animal Freedom Activists, Istanbul Urban Defense, Northern Forests Defense, Sarıyer Urban Solidarity and Freedom to Earth Association marched to the Kısırkaya animal shelter carrying a banner saying, “Close Down the Kısırkaya Concentration Camp, Don’t Touch the Right to Life”. As the protestors marched to the shelter that will eventually turn into a center of segregation and genocide, they shouted slogans such as, “Freedom to trees, animals, earth!”, “Tear cages apart inside and outside!”, and “Istanbul Municipality, Don’t Be Silly, Don’t Try Our Patience!”. The Republican People’s Party deputies Melda Onur and Haluk Eyidoğan, along with the fashion designer Barbaros Şansal supported the protest in which hundreds of defenders of the right to life participated despite the bad weather conditions and the difficulty to reach the shelter. Close to a hundred NGOs and activist groups working on issues such as ecology, animal rights, LGBT and human rights supported the protest as signatories. Çağlıer, who emphasized that the facility in question is a concentration camp designated as the new address for the animals segregated from their living spaces in the city along with people as a result of the urban renewal projects, said, “The Kısırkaya animal segregation center is the next step of the urbanization of northern Istanbul. The 3rd bridge project was the first step of this goal, and the plans continue today with the 3rd airport project as part of the mega projects network. It’s part of the process of surrendering the city to capital with unnecessary and imposed mega projects”. Çağlıer also reminded that the region shows as a second degree protected area and grassland in the development plans, and the shelter built on it hasn’t been included in these plans. The legal process of the lawsuit filed to stop the execution of and cancel the animal shelter facility, whose wires and gate were dismantled by the protesters, still continues. Activists who continued their protest after a short while left the facility stating that their protest had a warning quality and that they will not leave their animal friends alone. We are going through times where defending life has become extremely difficult, where we see shameless practices that one can rarely witness. 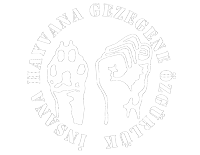 Today, we are at a location that symbolizes the organized crime committed against the rights of nature, right to the city and right to life; in front of a facility that they call, “Kısırkaya Temporary Unclaimed Animal Nursery and Living Space with Garden”, but one that will turn into a merciless concentration and segregation center for animals. · It is a concrete cemetery whose physical size is directly proportional to the magnitude of its violation of the right to life. Presenting the living conditions of animals collected from the streets and locked up inside four walls as luxury is nothing but concealing the fact that these animals have been detached from the city and convicted to a process that will result in death. Their experiences, habits and socialization throughout the hundreds of years they have lived together with humans have been completely disregarded. 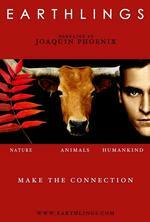 · It’s the product of a mentality that sees modernity as a skewed emulation of the streets cleared of animals in Europe. The conditions of the animal shelters are not measured by whether the technology used in its infrastructure is up-to-date but by the policies and practices of their managers. The efforts to acquit the municipality’s puppy slaughter in Hasdal and the inadequate and unmonitored animal shelter management in all of Istanbul with the claims that this is a modern shelter is an insult to the system of logic in the universe that we know. · It is a concentration camp designated as the new address for the animals segregated from their living spaces in the city along with people as a result of the urban renewal projects. It’s the malicious authority of the love of rent, capital and concrete over the right of animals to exist. This project in Kısırkaya is part of a process that will develop northern Istanbul and it is the destruction of the grasslands and northern forests of Istanbul that provide food and shelter. · It’s a monument of irregularity- an urban and environmental crime scene. This region is a wetland area with high winds where landslides occur, and it is not suitable for animals to shelter. It shows as a second degree protected area and grassland in the development plans, and this shelter built on it hasn’t been included in these plans. · It’s a ball of contradictions. The statements of the Istanbul’s municipal director Kadir Topbaş on TV, the defense of the municipality presented to the court for the lawsuit filed to stop the execution of the project and the clarifications of the municipality after our recent public statement all contradict each other with regards to the exact number of animals the facility can shelter. An institution and its director have managed to make three contradictory statements. Normally however, as stated in the 5th article of The Regulations for the Ethical Conduct of Public Officials and Rules and Principles of Application, the public officials are supposed to base their public services on honesty and reliable declarations. Upon the disclosure of this contradiction, the municipality made its social media department work endless hours and began to display information on the TV screens at the subway stations about the facility as if in a state of panic. The municipality virtually declared mobilization to legitimize this facility. · It’s a tyranny over non-human life. With this project, the municipality of Istanbul institutionalizes arbitrary interventions to animals’ right to life, exiles the animals from their homes in urban and rural areas, and foresees a slow death for them through segregation while destroying the habitats of the wildlife. · What’s deemed appropriate for Istanbul is further ecological destruction brought by the love of development. The Kısırkaya animal segregation center is the next step of the urbanization of northern Istanbul. The 3rd bridge project was the first step of this goal, and the plans continue today with the 3rd airport project as part of the mega projects network. It’s part of the process of surrendering the city to capital with unnecessary and imposed mega projects, and surrendering the public to drought and air pollution with the development of natural habitats that nourish life in Istanbul. This facility is illegal. What the decision of the courts might be, and however those in power might bend the laws to fit their capitalist goals, in the eyes of the residents of Istanbul, facilities like this will always be a symbol of segregation, rent, and annihilation. We do not approve of this huge facility that will lead to a genocide of urban animals, force the wildlife to migrate, create an uninhabitable environment for the local communities, and throw Istanbul out of balance through development. Istanbul neither needs the Kısırkaya concentration camp, nor the 3rd bridge and the 3rd airport. We are calling on everybody to take action against these projects that are against all life, and we are crying out again that we will be the watchdogs for all sort of mega projects planned in a carefree way and all sorts of attempts that will affect the living beings in the city.